The Golden Treasury is a book that hovers at the edge of awareness. Ubiquitous and protean, it turns up at estate sales, in used bookstores, in countless editions and in all shapes and sizes. Is it a children’s book, like A Child’s Garden of Verses by Robert Louis Stevenson? Is it translated from Persian, like The Rubaiyat of Omar Khayyam? My copy is about four by six inches, bound in green cloth stamped with gold, and printed in 1885 in London. It is not a first edition, and the binding is frayed. But the title page has the original vignette, an engraving of a naked boy seated on a hillock and playing a flute. The proverbial slim volume of verse, pocket-size, formerly called a small octavo, it is suitable for reading on a train, at a sidewalk café, or while hiking a windswept moor. According to the website of the publisher Palgrave Macmillan, the book began as a marketing ploy. Alexander Macmillan wanted to expand his firm from its learned Cambridge base to the general public. From 1858, he hosted literary gatherings on Thursday evening at his London office. The parties featured a round table and “tea and stronger fluids, with occasional tobacco.” One of those who attended was Francis Turner Palgrave (1824-1897), a civil servant in the Education Department in Whitehall, and the son of an eminent historian. In 1860, Macmillan, Palgrave, and the sculptor Thomas Woolner (1825-1892) discussed a new anthology of English poetry. Palgrave, a colleague from the Education Department named George Miller, and Woolner chose the poems with help from Alfred Tennyson, the poet laureate. Woolner also engraved the vignette. The book appeared in print in July 1861. Palgrave wrote a preface to explain his method, notes to the poems, and a dedication to his friend Tennyson. All these additions are concise and informative. From the preface, here is an excerpt. This little collection differs, it is believed, from others in the attempt made to include in it all the best original lyrical pieces and songs in our language, by writers not living, and none beside the best. . . . Lyrical has been here held essentially to imply that each poem shall turn on some single thought, feeling or situation. In accordance with this, narrative, descriptive and didactic poems . . . have been excluded. Humorous poetry . . . blank verse and the ten-syllable couplet, with all pieces markedly dramatic, have been rejected. The book sold well from the start, and it has never gone out of print. Its publication history is complex, but one point is striking. Though later editions added work by later poets, they preserved the original collection intact, with Palgrave’s notes and preface. Palgrave supervised the editions through 1897, the year of his death at age 73. His name still clings to the book, which has tripled or more in length. There are generous portions of John Keats (1795-1821) and Percy Bysshe Shelley (1792-1822). In fact, Book IV, devoted to the period 1800-1860, is “by far the longest,” as Palgrave says. William Wordsworth (1770-1850) dominates this section, with his sonnets, character sketches, poems on “Lucy,” and invocations like “Nature and the Poet.” Wordsworth was poet laureate from 1843 to his death. He and Samuel Taylor Coleridge (1772-1834), also present in The Golden Treasury, sparked the Romantic Movement in English poetry with their book Lyrical Ballads in 1798. It might be well at this point to mention that lyric poetry, to Palgrave and his peers, meant rhyme and meter. To many people today, it still does. In America, Broadway show tunes, country-western songs, gospel lyrics, and singer-songwriter ballads are the living, popular tradition. At the literary and academic level, a few magazines print co-called New Formalist poems. But modern taste favors free verse. The reader who feels this way will have a hard time with The Golden Treasury. Palgrave had strong ideas about presentation. The type font is small by today’s standard, to keep the book compact and affordable. Also, he wanted poems to appear whole on a page. The poet’s name is given at the end of each poem, often in an abbreviated form such as “A. Marvell” or “Lord Byron.” This was to focus attention on the poems themselves, he says. The editor knows no sonnet more remarkable than this, which . . . records Cowper’s gratitude to the lady whose affectionate care for many years gave what sweetness he could enjoy to a life radically wretched. Remarkably, the poems within each Book are not arranged by author or date. Instead, they are grouped by themes such as love, infidelity, regret, death, springtime, poetry, birds, youth, age, battles such as Culloden, and places such as Yarrow. Palgrave wanted to enhance the experience of reading and downplay the educational side of the book. From antiquity, The Greek Anthology used themes. Classically trained, Palgrave may have gotten the idea from there. In The Golden Treasury, we pick our way through a carefully planted garden. The “nation” from which poems were chosen was the United Kingdom of England, Wales, Scotland and Ireland. Of these, Wales and Ireland are under-represented, with the Irish poet and song writer Thomas Moore (1779-1852) ahead at five poems. Robert Burns (1759-1796) leads the Scottish contingent. His songs are still performed today, on both sides of the Atlantic. For Americans, the Scots dialect in Burns and others may be difficult, though perhaps no more so than Mark Twain’s use of dialect in Huckleberry Finn. Less known to us are William Drummond (1585-1649), the Laird of Hawthornden, and Thomas Campbell (1777-1844), with eleven poems. In the land o’ the leal. The book includes writers who are obscure today, such as Thomas Heywood and George Sewell. There are poems in which the music outweighs the message, like “Sally in Our Alley” by Henry Carey. There are humorous turns like “A Serenade” by Walter Scott, with its refrain: “But where is County Guy?” And there are whimsies like “On a Favorite Cat, Drowned in a Tub of Goldfishes,” by Thomas Gray. What should we make of Palgrave’s claim that these are the best? Consider Milton’s “Lycidas,” included as poem LXVI. Written in 1637, “Lycidas” is a pastoral elegy on the death of a fellow Cambridge student named Edward King. It contains many famous images and lines, including “Look homeward angel now, and melt with ruth,” which furnished a title for Thomas Wolfe. Yet no less a critic than Samuel Johnson (1709-1784) hated the poem. In a rant that goes on for pages, Johnson says that “the diction is harsh, the rhymes uncertain, and the numbers unpleasing.” In the eighteenth century “numbers” referred to meter, which Milton handles freely. Johnson excoriates the conventions of pastoral as artificial, and he finds the passage on “the ruin of our corrupted clergy” intrusive. Everyone else thinks “Lycidas” is one of the most beautiful poems in the English language. Is taste subjective, or can poetry be judged in an impartial way? If the music of language exists, can we read poems aloud, compare them, and agree on what is excellent? Palgrave cites “the vague general verdict of popular fame” in his defense. The 150 years since bear out his judgment. Yet poetry anthologies have proliferated in that same span of time. Some of these may be better than Palgrave’s. In America in the twentieth century, Louis Untermeyer edited dozens, including one called The Golden Treasury of Poetry in 1959 for children. Oxford University Press has an anthology for every conceivable subject. The Penguin Book of English Verse, edited by John Hayward in 1956 and again by Paul Keegan in 2005, has a more representative sample, chronologically organized, with original spelling and punctuation. At 1,184 pages, though, it would be hard to slip into a pocket. Much of the appeal of The Golden Treasury lies in its portability. There are anecdotes of soldiers carrying a copy into battle. Even in the age of hand-held electronic devices, some readers prefer the tactile pleasure of the small book, the well-crafted artifact. Young people do not memorize poems the way older generations did, or recite them for entertainment, but they are avid consumers. True, Tennyson is missing from the 1861 collection, because it has only “writers not living.” He, Matthew Arnold, William Butler Yeats, and a host of other classics appear in later editions. Their absence does not lessen the value of the original book. If poems are well known and widely available, why anthologize them? Why not get a volume of Shakespeare’s Sonnets, for example, or the Complete Poems and Songs of Robert Burns? Like fresh fruits and vegetables for the diet-conscious, good poems are often out of reach. Palgrave and Macmillan performed an early feat of packaging. For all its outdated forms, The Golden Treasury shows how clarity and beauty of language can stir emotion. The last poem in the 1861 collection makes a superb end to the book and to the argument for lyric verse. Written by Shelley, it has eight lines and no title. 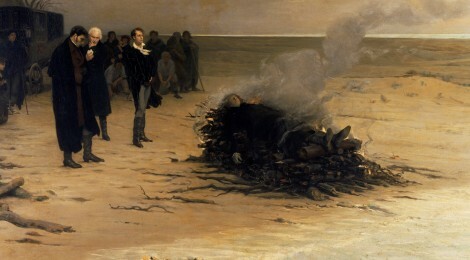 Image: Louis Edouard Fournier’s Funeral of Shelley, wherein Lord Byron is seen to attend. Robert Boucheron is an architect in Charlottesville, Virginia. His writing appears in Aldus Journal of Translation, Atticus Review, Bangalore Review, Conclave, Construction, Digital Americana, Gravel, Grey Sparrow Journal, IthacaLit, JMWW, Lowestoft Chronicle, Milo Review, Montreal Review, New Orleans Review, North Dakota Quarterly, Origami Journal, Poydras Review, The Rusty Nail, Short Fiction, Slippage, StepAway Magazine, Work.